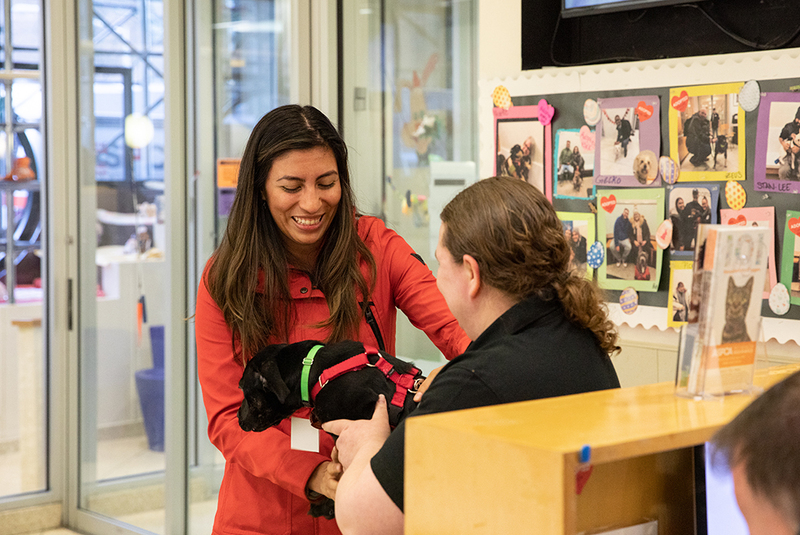 Every day at the ASPCA, hopeful adopters meet their matches in the form of cuddly cats and devoted dogs. 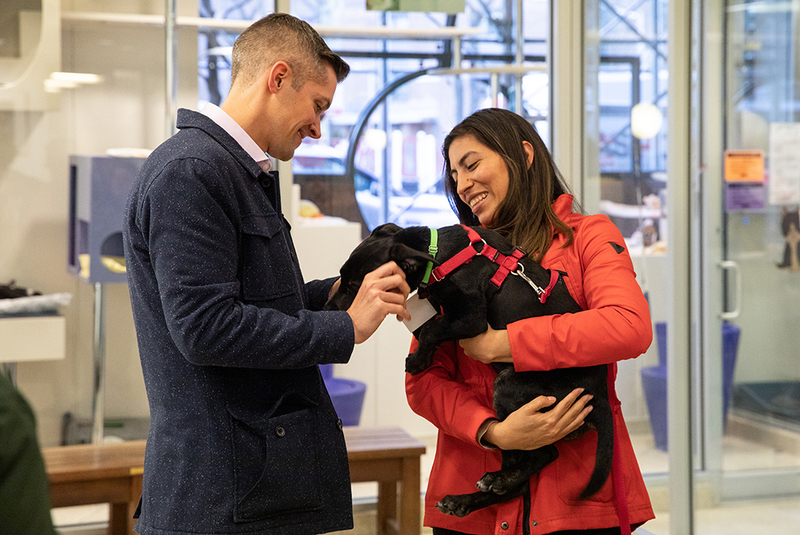 But for Sean G. of Manhattan, a three-month-old black Lab named Sadie also inspired another kind of match—one delivered in the form of a marriage proposal to his longtime girlfriend, Lesly. 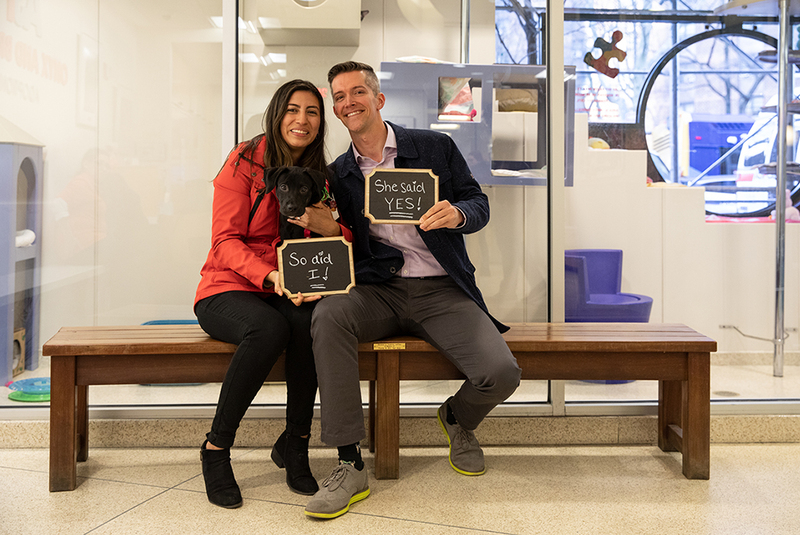 Sean and Lesly had fostered Sadie for nearly two months and were coming to the ASPCA Adoption Center on April 4 to process Sadie’s adoption with Lesly’s sister Yohanna. The plan had been for Yohanna to adopt Sadie. At least that’s what Lesly thought. As Polly Stein, ASPCA Manager of Admissions and Matchmaking, reviewed Sadie’s adoption paperwork with Lesly and Yohanna, Sean stood by anxiously. Nearby, a photographer waited behind a counter chatting with a videographer who pretended to enter data into a computer. Other staff—all in on Sean’s secret—went about their business. Lesly hugged Sean, and as tears welled up in her eyes she barely noticed the sudden presence of cameras. Sean paused. Then he dropped to one knee. More tears, and then a confident “yes” from Lesly. Sean produced a small box containing an emerald-cut solitaire diamond ring. Moments later, he turned and thanked the ASPCA staff, who cheered and clapped. “They’ve been in on this from the start,” he told Lesly, as more hugs, smiles and congratulations broke out. 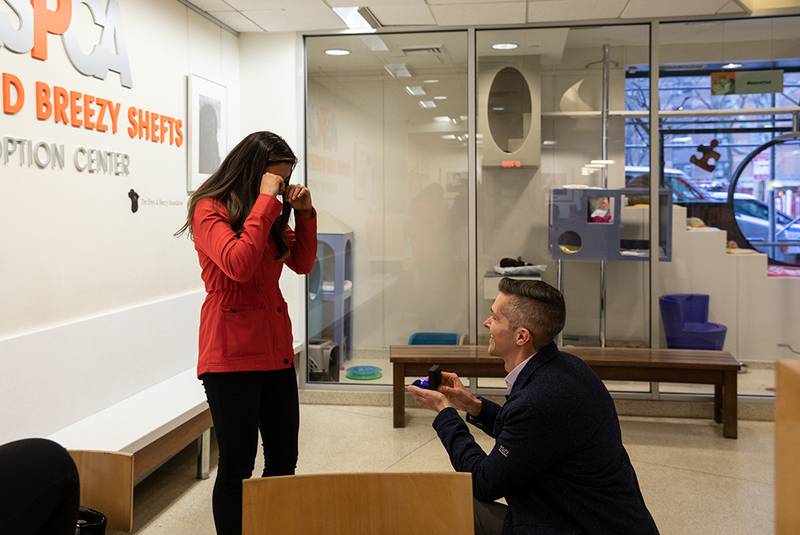 What prompted Sean’s choice to pop the question at the ASPCA? Sean recalls how Lesly’s elderly dog, Rocky, spent the last months of his life commuting with Lesly, a paralegal, to work every day so he wouldn't have to be home alone. 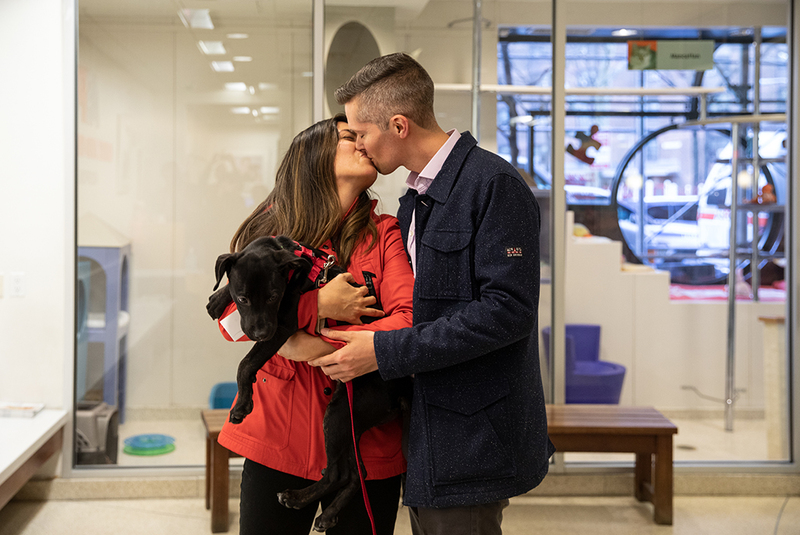 The couple instantly fell in love with Sadie, who was transferred to the Adoption Center from Oktibbeha County Humane Society in Starkville, Mississippi—on Valentine’s Day—by the ASPCA’s Relocation Team. Once Sadie was medically cleared for adoption, Sean put his proposal wheels in motion. For Sean and Yohanna, the hardest part of the plan was sticking to it. “When Sean told me he wanted to adopt Sadie and use her to propose, I went along with it—we all did,” says Yohanna, adding that her five-year-old and seven-year-old sons love Sadie, too. “The ASPCA helped Sean pull off the best surprise of my life,” says Lesly. In addition to Polly and Matthew, the behind-the-scenes team included Kelly DiCicco, ASPCA Manager of Adoptions Promotions, and Adrian Peña, ASPCA Senior Manager of Foster Care and Placement. 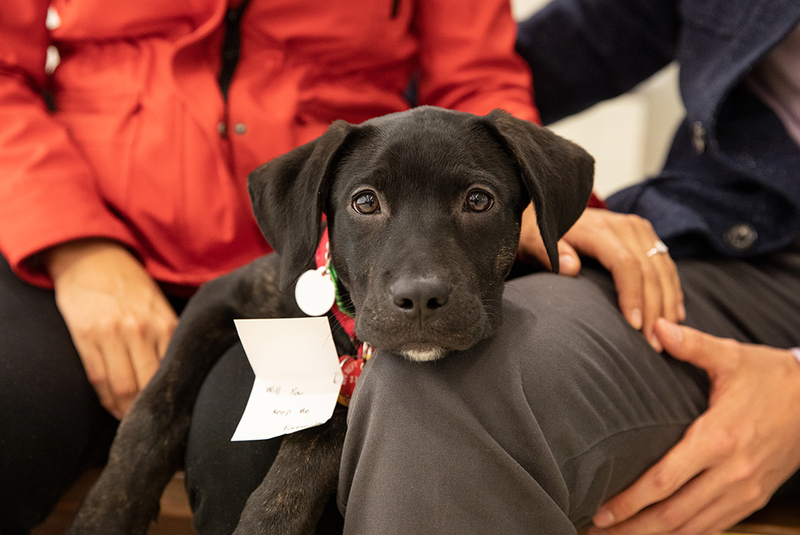 “It’s touching to think we’ll forever be a part of their special moment,” adds Kirstin Burdett, ASPCA Senior Manager of Admissions and Matchmaking. As an early wedding gift, the ASPCA paid Sadie’s adoption and licensing fees and sent her home with a decorated bag of supplies. While Sadie’s adoption was instantaneous, the wedding may be a year or more away. In the meantime, Sean credits the ASPCA with playing a “starring role” in his engagement. But the true star is Sadie, who brings more love and joy into Sean and Lesly’s relationship as she graduates from a temporary to permanent role in their happiness. Her playful nature is sure to keep the trio happily fur-ever engaged.